This entry was posted on February 21, 2013 by Katie. 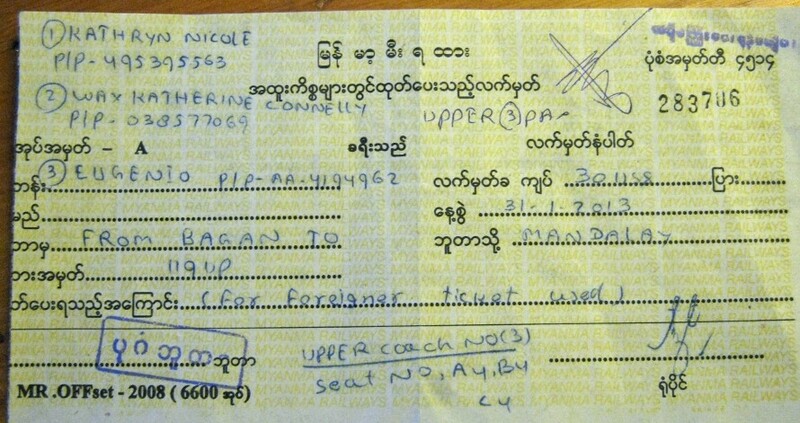 It was filed under Myanmar (Burma) and was tagged with Bagan to Mandalay, Burmese trains, Nyuang U train station, train travel in Burma, train travel in Myanmar. Myanmar was kind of on my bucket list of places to go, but I am old, and some of this sounds like something I could have done when I was young like you, but not so sure I want to pee in a dirt hole……..although I have done it in Italy before 🙂 I am living vicariously through you. Love your spirit !! I am coming back to Europe this summer, but not sure I will be near Rome on this one – Southern France. One of my trips fell through but still plugging away at my plans. Sally – Myanmar was very challenging to travel through. It is possible to travel more comfortably by flying from place to place, joining organized tour groups, etc. The problem is that the majority of your money would either go directly to the corrupt & abusive government or to its cronies. If you’re a responsible tourist, and you want to help the cause, comfortable travel is not the way to see Myanmar.